From Richard Prebble's "The Letter"
There is now a website quoting Labour's own website "Labour is issuing a pledge card again this election…" If the Police read that, it blows away the claim that it was not an election expense. Clark's next problem, a select committee decides to hold a hearing and summons her to explain. 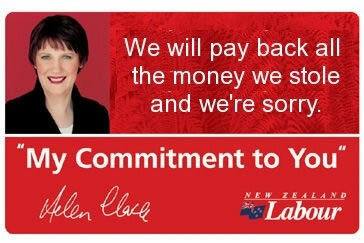 Clark's sudden memory loss won't work in front of MPs. Just Like the Good Old Days? Towards a New Communist International?